Most of you know by now I am a runner. 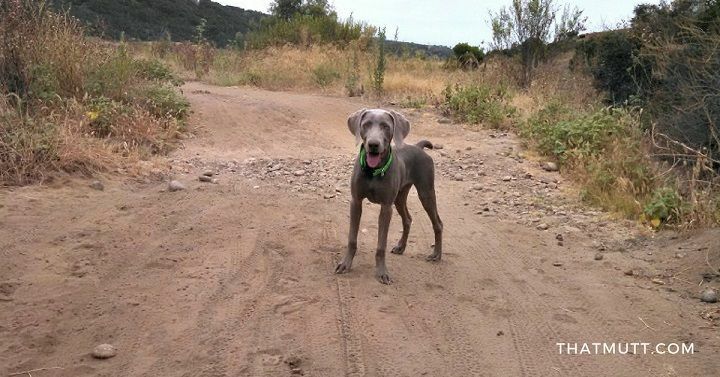 I’ve recently started running with my almost 9-month-old weimaraner. I don’t even like running all that much, to be honest. Who would? 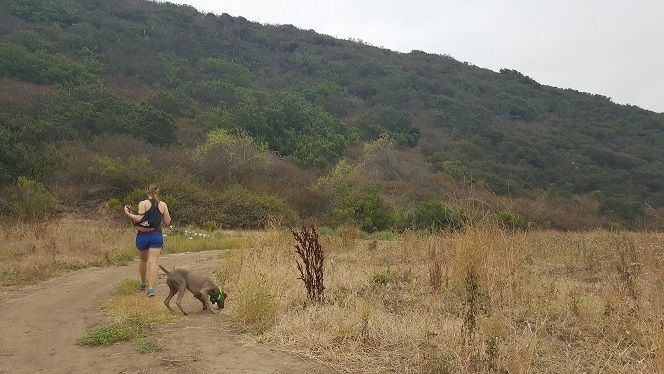 But what I do love is how running connects me to my dogs. Distractions that become a big deal while walking (other dogs, friendly strangers, interesting smells) seem to disappear while running. My young dog focuses on the task at hand – being with me. Instead of pulling, he floats. Treats don’t even matter. For 25 minutes, we’re a team. 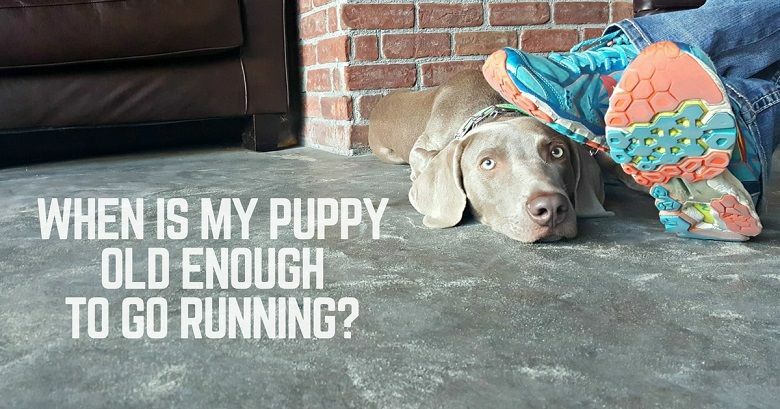 When is it safe to start running with a puppy? My weimaraner puppy is almost 9 months old now, and we are doing some light, slow running up to about 2 miles four or five days per week. 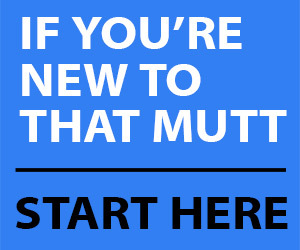 This is not a post about what you should do with your puppy. 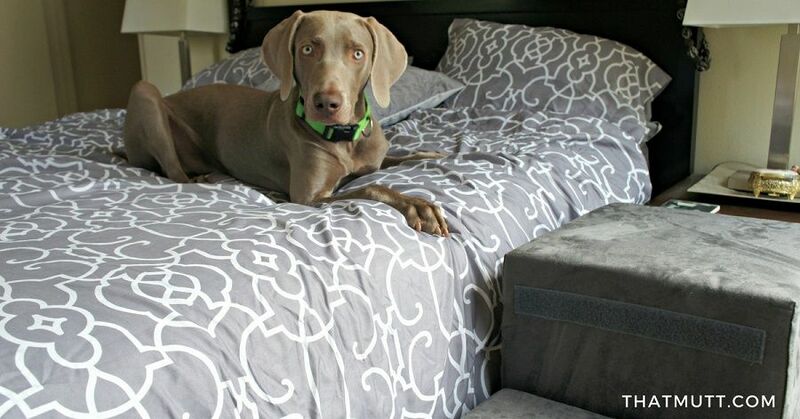 I’m sharing what works for me and my weimaraner. Many veterinarians, dog trainers and breeders will say you should not run with a dog at all until his muscles and bones have physically matured and growth plates are closed. This is usually around 12 to 18 months, depending on breed. Larger dogs tend to take longer to mature physically (and mentally). Too much “forced” exercise can potentially cause damage to a puppy’s developing joints, these experts say. These warnings should be taken seriously. Yet, people can also take this to an extreme. I’m aware of dog owners who have carried their young Labradors up and down stairs for a full year. The reason? To protect their dogs’ joints. I’ve seen 8-month old puppies already overweight because they’re not getting walked. And on the behavioral side of things, the United States has a real problem with young, healthy dogs being surrendered to shelters and rescue groups. Mainly larger breeds. It doesn’t take a scientific study to figure out a real factor here is these dogs are under-exercised, untrained, poorly socialized. Just plain difficult to handle. So, it’s all about balance and common sense. Personally, since my puppy is extremely high energy (explosive!) and too smart for his own good, I have always sided on getting him out and about for proper exercise, training and socialization. I said exercise first for a reason. He needs it. For me, the risk of not exercising my particular puppy enough is a more serious risk than overdoing it. Keeping him exercised keeps him somewhat manageable. Being a serious runner, I know that 1, 2 or even 3 miles really is nothing for an active, sporting breed. Even for a puppy. I’m not taking my puppy out for 5-mile runs. YET. We’re not doing intense workouts. We don’t sprint. I don’t even throw the ball over and over and over. These 2-mile, light runs are my way of taking it easy on him. We might go at a 10-minute per mile pace, tops. Usually slower. And I still worry I’m overdoing it! This is not a guide. There is no science behind this. It’s simply what I’m comfortable with after discussing with my pup’s breeder and my pup’s vet and Good Ol’ Common Sense. 2 to 5 months: No running other than during play. Plenty of leash walks 1-2 miles per day at first and soon 2-3 miles per day walking. Eventually increase up to 4 miles per day walking. 5 to 6 months: 5 to 10 minutes of slow, steady running during our walks once or twice a week. Total distance per day 2 to 4 miles (mostly walking). 6 to 8 months: Slowly begin to add a mile of running a few mornings per week. Continue with daily walks 2 to 4 miles. 8 to 12 months: Running around 2 miles a few days per week, continuing with long walks. 12 months: This is where I’ll probably start running 3, 4 or 5 miles most days and not worry about speed anymore. 18 months: Let’m run! This is where I’ll take him just about any distance, any speed, within reason. If I’m doing 8 miles, he’ll go 8 miles. If I do 20, he’ll probably do 20. And that’s not a joke. My senior dog Ace did long runs of 15 to 20 miles a day in his prime. Heck, weimaraners are bred for endurance, for running all day long in the field! Genetics. My puppy comes from a line of working weims where there are no hip and joint problems. His parents and grandparents are competitive hunting dogs. His grandpa is 12 and still works in the field. Remy’s breeder gave me the “go” to start running with him at 6 months. I’m taking a more conservative approach and slowly easing into it. Spay/neuter. Most of the new research says that early spaying and neutering affects a dog’s muscle and bone development, especially for larger breeds. Remy’s vet advised me to wait on neutering my puppy until he’s at least a year old because of all the studies that link early neutering to torn ACLs, hip problems and other joint issues. Being a runner, I decided delaying the neutering would be best for Remy. I’m thankful we have a vet who keeps up with the latest research. When people warn about not over-exercising a young dog, perhaps they should also warn about the effects of early spay/neuter. This is yet another big problem in the United States, with rescue groups regularly neutering puppies as young as 8 weeks old. More here. I’m not saying my approach is best. Perhaps I’m overdoing it with my puppy. No one knows for sure. This post is meant to start a discussion for those who run with their dogs. I know I’m not the only runner wondering how long I should wait before allowing my little athlete to join me for workouts. God knows he has the energy for it! How many runners do we have reading? When did you start running with your dog? How far can I walk my puppy? Are rescues neutering puppies too young? I’m doing everything wrong with my puppy! Dear heavens I can’t imagine carrying a lab over 6 months up stairs! I’ve always wanted a large breed dog but I’m starting to see the benefits to my small terriers. Link is 9 months old and we only do brief, occasional runs together because I’m the one with bad joints! I’ll admit…we started really early with running, but my GSP was (and continues to be) very, very active. I know that the daily exercise she got was what kept her from the destruction and escaping i hear is so typical of the GSPs. We started run/walk at her pace right away…nothing forced, when she wanted to stop to sniff, we stopped…she sniffed…by the time she was 6mo old we were jogging about 3 miles a day. By the time we hit the 1 year mark, it was 2x day runs most days totaling 7m/day and 5 miles being the longest run. Now she is 5 and runs everything with me, even marathon training. I try to make our long runs off leash so she can do everything at her own pace (this typically includes swimming in whatever water is around). I have had her checked over by the vet, he has said she’s in excellent condition, and just keep doing what we’re doing. I also started her on joint supplements early. I don’t know that they work, but it makes me feel better about my little running buddy. Oh this makes me feel so much better! Thank you for the post on GSP I have a 10 week old full of energy. I’m a big runner to so it’s great that i know it’s okay to run my pup at an early age. It’s totally at her pace for a 5k loop around the farm but she is so awesome and it really does wonders for any destructive behavioral issues. I have an Australian Cattle dog. One of the reasons I got him was to have a dog to go running with me. I started running when my lab was about 8 or 9 years old. I really loved it but she has reached the point where a long walk is all she can handle. (She’s 11 1/2 now) My cattle dog is 9 months old so I downloaded a pooch25k and will start next week. This way by the time he’s a year old we’ll be in great shape for full longer runs. He’s also fear reactive so I know running will be awesome for both of us. My mom never starts running until we are a year old and then we work into it. The risk of injury is not worth starting too early. We are always so sad when we see people running with young puppies. One needs to make sure the bones and joints are ready so you don’t cause any permanent damage. Mom loves to run, but running with dogs is the absolute best! I have an extremely hyper and wild little pistol of a black lab mix and I cannot imagine how we would have survived up until now if we didn’t walk/run/play like crazy. She will be 7 months in a few days and we have been doing a nice exercise routine since she was about 4.5 months. Chew toys and socializing are not enough and without a solid 45 minutes of exercise a day, my carpet is ripped to shreds or the wall send up with holes in them. As a dog owner for over 25 years, I sincerely believe exercise (in this instance running) is a fabulous outlet for them and us!!! i used to run with all 3 of my girls, just up the road or in the fields. my oldest cant run anymore. the other 2 gals run with me sometimes on long lines. i let them explore and they run along side of me or run while checking out what is in the woods. i have a lot of woods with lots of deer, rabbits, etc. since the are small, i have to take smaller strides and watch they dont get hot or so tired. they love to run. Evie used to run a lot when she was younger, we would run a mile or so. i run more by myself. running is a good way to muscle them up and get them stronger. as dogs age they lose their belly muscles, so sometimes we will even do sit ups. the vet showed me how to strengthen their tummy muscles. My Boarder Collie German Shepard mix is super hyper and when I take him for walks in the forest of 4-8K he runs most of the time and has since he was 10 weeks old. And still he wants 3-4 hours of play in the yard after. If I miss a day in the forest w him he runs laps of the yard on his own, He naturally loves to run and quite frankly would be unmanageable if he didn’t use up his boundless energy. The down side is I will have to take up running longer distances than I normally do as he matures! I liked hearing your input on this. Thank you for writing this article! I started running with my GSP/husky mix but I only do it a few mornings or evenings in the week. I didn’t know that running too early or too much could be an issue for him (he’s less than 6 months old). But he DEFINITELY needs exercise otherwise he’s bored and unhappy. I’ll definitely err on the side of caution and do long walks until he gets older. Do you have any tips on changing up your running in hotter or colder than average temperatures? I used to live in Fargo, N.D., and I ran in almost all cold weather with the dogs (I owned a dog running/walking business there). In extreme cold, when it was -10F or colder, I would stick to a shorter route right by the house so we could duck back inside if the dog got too cold. But we could almost always run for 20 mins. The heat is more dangerous in my opinion. I bought a vest for ultrarunners (Ultimate Direction is the brand, I believe) that is lightweight and can hold two water bottles. It doesn’t bounce around and I can keep a small collapsible dog bowl in the pack with the water bottles in front. In the heat, I do sometimes leave my dog home and I always bring water for him if he tags along. I try to run early mornings like 5 a.m. or in the evenings like 7:30 p.m. I find that some dogs (like mine) do not know how to quit when they get too hot so I have to watch out for him. The cold is less of a worry for me and probably you to if you have a husky mix.